Very nice! Thank you for sharing that SharkyPR. Hmmm... I had Cobb Stage 2 on my 2012 Ralliart and it was great getting me to 21 PSI and I like being able to monitor a lot of my stats live and with excel sheets after. Is COBB stage 2 that dangerous? I'm curious btw how I would test for a BOV at fault? It shouldn't be the reason for my acceleration hesitation though since I get to 18 PSI on stage 1 consistently? What else could the hesitation on RPM be from? It appears to happen more noticeably when pushing on gas not hard enough. Perhaps the chain a little bit stretch causing the unsmooth REV up? I can't feel it at all really unless very very lightly accelerating to go faster. I will need to get gas soon and will run a bottle of Redline Fuel System Cleaner to see if it helps and will keep you all posted. Last edited by ipointatthesky; Jul 17, 2018 at 10:06 AM. Safer by I haven't seen or anyone report a car blowing a trans/engine using the GST map compared to people nuking their cars on the AP. AP doesn't have access to important SST tables when doing proper tuning. Based on that I would consider you may have glazed clutches, which again get a tactrix cable and Evocan and you could check clutch slip yourself. I can't back up Raikiri enough on the tactrix cable. hmm ok you all sound convincing. If i buy the tactrix cable from their website, the rest should be free right? How updated is the most updated GST basemap? I have a 2011 Ralliart and I do see the thread link for the map is it. To be honest it was just a little pain to follow the instructions and it seems to throw error codes for some people so i wanted to see if it was possible to use the Cobb and somehow replicate a map to load onto my car. I know the AP lets you add custom map but apparently the SST maps are important which Cobb basemaps don't cover? i only will at most need or want to go to Cobb stage 3 if my car/wallet lasts lol. Getting to 400 hp is my max after if i don't sell it by then. I know the first time flashing can be scary, is there anyone on here in your area that can give you a hand, all you might want is someone who has done it before to reassure you but it's way easier than it sounds. You mentioned the BOV if you still have the stock plastic one, junk it and get at least a stock Evo one. He also said that the noise in engine bay is most likely my loud AC and also the clutches chatter. I am definitely going back to him for any services because it costs the same, mobile, on my schedule, and by the way he talks about the problems, he's definitely familiar with Lancers and Ralliarts. Last edited by ipointatthesky; Jul 18, 2018 at 10:14 AM. Mine is like that too. So I wouldn't worry about it. That is a question that a mitsu engineer involved in the design of the ralliart can answer. 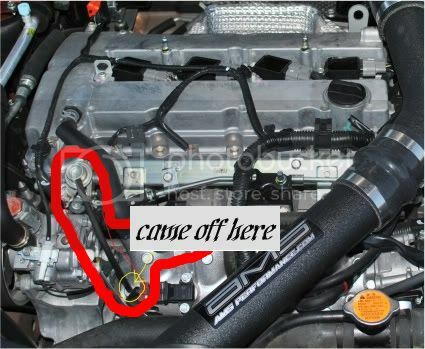 Maybe on the EVO is used to secure the intake or something else that we don't have. Over the years the sentiment over Tactrix (OBD2 Interface) + Ecuflash (software) has been positive. In comparison to AP. That is what I use on mine. GST basemap for boostpill. The car runs great since day one. I managed to clock high 4s 0-60 with that. Highly doubt that AP base tunes are able to do that. Never seen it before on a car with just a boost pill. Why is your car cruise light on btw? Were you happened to just be on cruise mode and never turned it off? I use it a lot but it wasn't engaged. As other said these cars engine bay is very noisy, Like a diesel truck. Driving in normal mode, automatic + cruise control is your best bet for good MPGs. At times I can see my meter show between 22 -25 AVG MPG. At the pump I do 20MPG. I do a lot of spirited pulls just to listed the GFB Dual Port blow off valve noise. Is set to around 50/50. That's pretty good MPG but I HATE driving on automatic. The gears shifts when I don't want it to and for immediate responses lags a bit if I suddenly have to accelerate (example: beating a yellow light or weaving in traffic...not to mention engine knocks because of the initial lag between me pushing on gas hard and the gears dropping down not fast enough. Driving normally on manual, I get about 18 MPG but I do a lot of short distances that's why. If longer distance, I get above 20 MPG. Btw how crucial is it for me to replace the BOV? I know a lot of posts say how trash the plastic Ralliart one is but I have no boost leaks so shouldn't be a problem unless I go higher power? I have an EVOX one around. Is plug and play and metallic. Is what most people upgrade if they want to keep a 100% recirculated system with Mitsu parts. Send me a private if you are interested. Sport(or S-Sport if you have it yet)/Manual for daily driving and Normal/Automatic for highway cruising for the best mpg and clutch life. Normal/Automatic slips the clutches alot for comfortable daily driving which wears them down faster. i have heard that and i see the logic. Is it just my clutches playing with each other? This is true happened to my 2009. Solved by putting some glue on it and also on my 2015 when I bought it. Last edited by SharkyPR; Jul 20, 2018 at 05:59 AM.